My studio has been taken over by the coziness of Christmas. My KittyCat, Calliekins, pops up from time to time to cuddle with me on the sofa while I am planning my holiday lists. The countdown to Christmas, my seasonal target date, is getting hectic. All these Advent Calendars are not making it any easier! First, we have KittyCats’ Advent Calendar, which is offering a darling gift from a KittyCats friend every day. Today’s gift was a darling antique cabinet with doors and a drawer that open and close from Bebe Begonia. I put books in but you could put anything you like in this antique cabinet. Speaking of Advent calendars, Cory Edo is offering a great one at the Arcade, which offers 12 gifts for the 12 days of Christmas. You pump your quarters into the gacha machine and it spews out keys that can be rezzed to open the doors. DO NOT rez a key for a door you have already opened. You will render it unusable—one key opens one door once only. I rezzed the #1 key and got this darling holiday bird with frame. If you hadn’t noticed, I decided to begin to look a lot like Christmas myself with this short sleeved turtleneck from LacunaInc. The weather being what it is today, short sleeves would not do well for me in RL but in SL, it’s always the perfect temperature, so I could snuggle up on a Holiday-theme sofa with Calliekins and enjoy the twinkling lights on the holiday tree from Cory Edo, both offered at FaMESHed. Ceberus Noel is offering these cute cuffed boots for the winter season made from mesh. Finally, I gave myself a holiday appearance with green eyes from Audrey Lamede and one of the Shyla Diggs/Tricky Boucher skins being offered at the Arcade. With beautifully lined eyes and a deep red mouth, this ones a keeper if you only get one. And I am wearing the rare long hair from MissAllSunday Lemon in Ash, which is also being offered at the Arcade. For this blog entry, I imagined an art collector with a country home—a modern villa with plenty of wall space for hanging paintings and sketches and photographs. (I do realize art encompasses more than this, but indulge me here.) 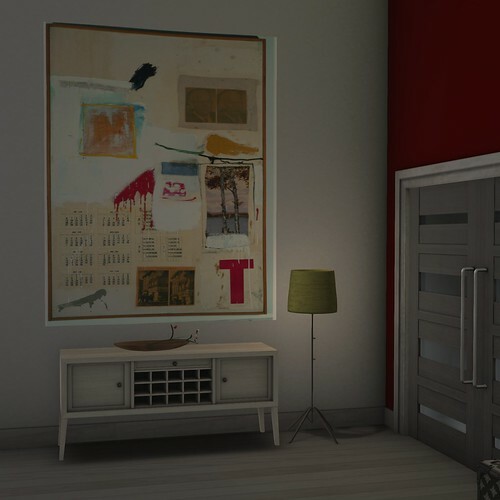 I pulled some pieces from my collection on curiator.com and put them up on the walls and went to town with new items from FaMESHed and Collabor88. Cory Edo has made a collection for FaMESHed with a sort of postmodern bent. With suggestions of earlier periods, she mixes funky with traditionalism, modernist curvy lines with varied surfaces to offer a set that seems eclectic and pulled together all at once. The furniture features a variety of PG, and if you choose to upgrade, adult poses which will make it very versatile. And I even snuck in BabyChampagne Sass’s modern trunk (as my art collector travels back and forth quite a bit). Putting this collection in the villa that Cory is offering at Collabor88 was a no-brainer. It all fit together. The villa itself has a large open space with two rooms off the main space and three levels climbing up. She offers it in a shadowed white, which you can customize to your pleasure. I tinted the floor and several walls to pop color in our art collector’s house and give a tension to this modern but homey space. As always she offers privacy settings, pull down blinds, and locks on the doors so art thieves can’t creep in. 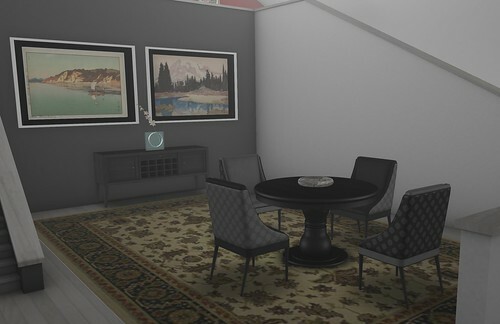 Tya Fallingbridge’s dining room set at FaMESHed is a gorgeous addition to this house. With color change built into the table and credenza and changeable fabrics on the chairs, it’s entirely customizable. The modern lines of the chairs and credenza compliment the more traditional round table and provide a handsome or beautiful look to a dining room (depending on your styling). Our art collector is, of course, eclectic and stylish and I tried to show this with a black pantsuit that Spooky Mistwallow has made for the Black Fair. Coupled with strappy stylish shoes from TeamRedgrave (made orange to pop), the look is sleek but also colorful, especially with Maxi Gossamer’s Limited Bazaar jewelry. Funky nails from Giela Delpaso mix it up in this colorful assemblage. I used the elegant gold shadowed skin from Izzie Button, a feature at the Black Fair, as my palette. With dark brows and sleekly lined eyes, the skin has a neutral lip, perfect for our art collector. And a casual wavy flip from Chiaki Xue completes the look—she doesn’t want to look contrived.